Health Frontiers has worked with the Lao University of Health Sciences and the Lao Ministry of Health for 25 years to improve health of the Lao people by developing and implementing post graduate training programs. 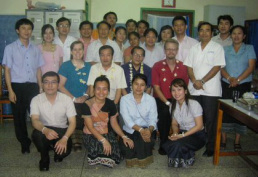 HF has supported Pediatric Residency Training in Laos since 1997, and Internal Medicine Residency Training since 2002. To date the two training programs have graduated 98 Lao pediatricians and 79 Lao internists. 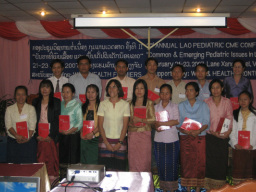 Lao Pediatricians receive AAP Redbooks at annual CME conference. In order to further develop clinical and teaching capacity in Laos, HF is supporting fellowship training for residency program graduates. Lao physicians have completed or are completing fellowship in specialties including adult nephrology, adult neurology, pediatric infectious disease and pediatric hematology. HF values lifelong learning for Lao physicians, and supports annual CME activities in Lao language, attended by program graduates and other health care workers from across the country. Health Frontiers is currently working with the University of Health Sciences to start the first Emergency Medicine training program in the country. If you would like to learn more about this or are interested in volunteering, you can contact Dr. Kristiana Kaufmann.